This is a fun picture book that blends English and Maori text and bright illustrations, aimed at 7-12 year-olds and released for Matariki 2016. The Tunnel in our Backyard is the second in the innovative series from Malcolm Paterson's Sharing Our Stories venture, which aims to bri... read full description below. 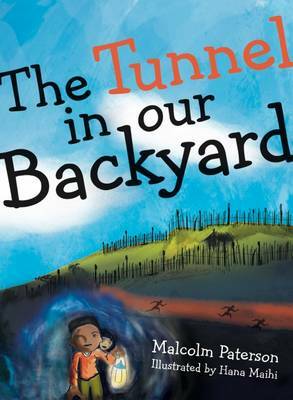 A charming picture book that blends English and Maori, The Tunnel in our Backyard brings to life for children the history of Auckland - specifically Mount Albert, Point Chevalier, Te Atatu and Waterview. Jennifer and her whanau go to Te Atatu to help her cousin Tui's family move house to Mount Albert. What they learn from Nanny on the way about Matariki and the Waterview Tunnel leads on to a big discovery once they reach Mount Albert - that old tunnels also run under here! Under the guidance of Nanny and new neighbour Tefere, the kids relive old and more recent history and follow in the giant footsteps of the ancestor Ruarangi from Mount Albert down to Meola Reef in Point Chevalier.